We, EVERYDAY INTRADAY TIPS is an emerging Intraday Tips entity which is being popular among Intraday Traders rapidly. In past 1 Year over 12000+ Active users and most Rated and best accurate Tips Provider in Industry as per our Followers, we are providing Tips with more than 85 % Accuracy. 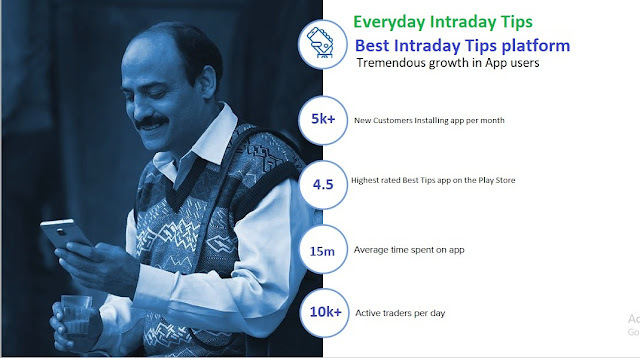 The aim of EVERYDAY INTRADAY TIPS is to make awareness among Indians regrading Share Market and bring them to the way of Rapid growth and make our Indian Stock Market Indian dependent. And could Remove the fear of Foreign Institutional Investor (fII) AND Foreign Portfolio Investment (FPI). And Best tips for Intraday Trading & Investment. The team EVERYDAY INTRADAY TIPS is full of those who are specialists in their fields and from various Age groups. there are up to 25 years Share Market knowledge holders in our team. That's why we provide you so accurate tips. Also we have a team of IT specialists, That is trying it's best to bring more best product for you.